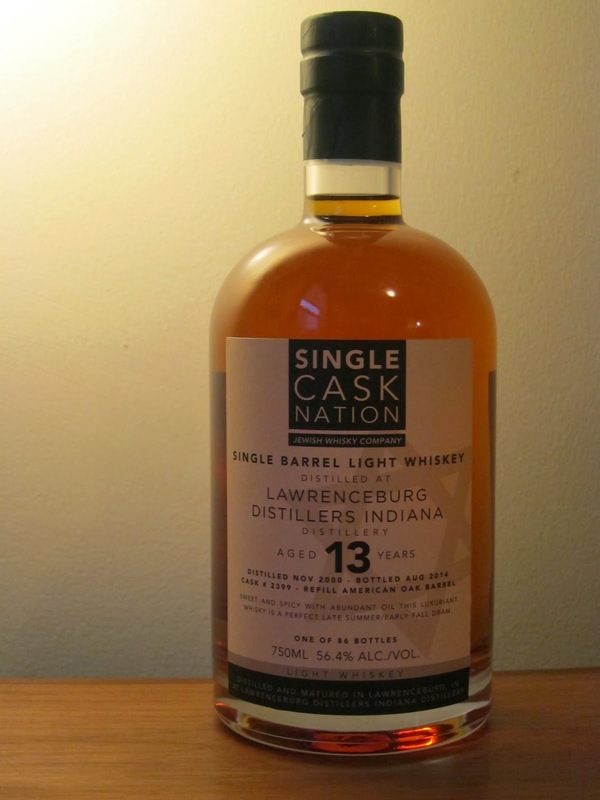 Single Cask Nation LDI 13 yo (56.4%): And another Thanksgiving has been survived without a serious food coma. We came pretty close but the situation got handled very professionally. Today, the day after, is the day we get lazy and recover as much as we can. Single Cask Nation's light whisky is the choice to accompany this beautiful brisk sunny day at home. It is one of the new(ish) expressions from SCN released in 2014. It is actually the first light whiskey I have ever seen bottled by any bottler whatsoever. The whiskey is distilled in Indiana by Lawrence Distillers Indiana (LDI) in November 2000 and bottled at cask strength in August 2014 after spending thirteen years in a refill American oak barrel. Today the distillery is known as MGP, Midwest Grain Products after the last ownership change in October 2011. Before I start with the tasting notes let's get this light whiskey thing straight: TTB defines light whiskey on their website as a whiskey distilled in the US at more than 80.0% abv / 160 proof (but less than 95.0% abv / 190 proof) and matured in used or un-charred new oak casks. This particular cask yielded 86 bottles only. Color: Medium amber, polished copper cookware. Nose: Maple shortbread cookies, toffee and light dusting of cinnamon and cloves. Wood shellac and turpentine. Fried doughy Middle Eastern desserts buried under a thick coat of confectioners sugar. Palate: Orange zest, allspice and fruit cake. It's kind of incredible that I almost forgot to add water at this abv. A few drops of water dissolves the thick oily texture a little but also make it way more approachable. Orange blossom honey, linseed oil and polished hardwood furniture. More pronounced cinnamon, candied pecan and concentrated orange extract. Finish: Sweet(er) with orange-ginger marmalade, clementine and garam masala. Spices got sweeter and more Indian than Middle Eastern towards the end. Overall: I like how the boys of Single Cask Nation never cease to amaze us... Right when you think that they must be out of tricks they find something else to knock our socks off. Who else would think to bottle a single cask expression of a light whiskey at cask strength? I will admit that I didn't even wait to taste it and ordered the full bottle when they first released this oddball. And I am so glad that I did - It's sold out in a couple months. It is rich, incredibly oily and smooth. I have to say that I don't have necessarily the required sweet tooth to go bananas about it but I dig it. This bottle won't last long in this household for sure... It makes great pairings with rich chocolate cakes, bold strong coffee and light mellow cigars. Tested and approved... Happy belated Thanksgiving everybody..!